Lilo is a cute, thoroughly mixed-up Hawaiian orphan constantly at loggerheads with Nani, her twenty-something sister and guardian. Life’s been one long round of arguments since the girls’ parents died in a car crash. Lilo has become angry, lonely and withdrawn. In order to help her deal with those issues her sister allows her to adopt a small ugly “dog” from a pet shelter whom she names Stitch. 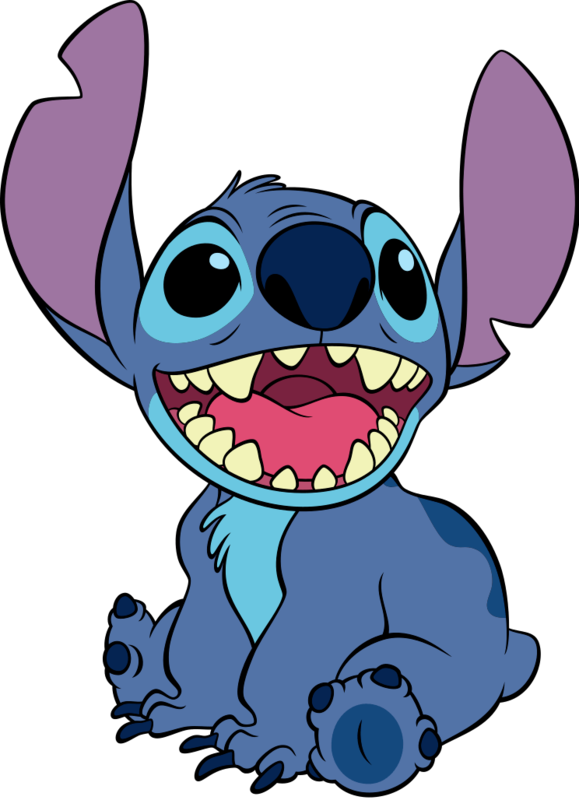 Stitch would be a perfect pet if he weren’t in reality a genetic experiment of an alien mad scientist who has escaped from another planet and crash-landed on Earth. Through her love, faith and unwavering belief in ohana, the Hawaiian concept of extended family, Lilo helps unlock Stitch’s heart and gives him the ability to care for someone else before it is too late. Lovely Melfka practically blackmailed me to watch this one and I am very pleased she was so obstinate. Sometimes I really need to be pushed when it comes to Disney movies. I’ve been burnt and now I am extremely shy. 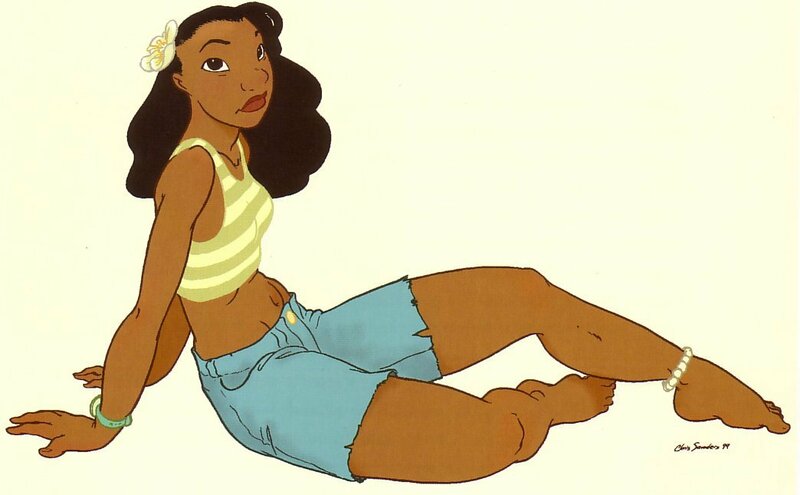 Nani’s thighs are almost as thick as her waist but still she looks more real than most of Disney heroines. In this case, though, I didn’t regret borrowing and watching the movie. Definitely edgier than traditional Disney fare, Lilo and Stitch explores issues of family while providing a simple, charming story. There are no princes or/and princesses here, there is no magic (unless you count sci-fi elements as such) and, surprise, surprise, cartoon characters dare to look as close to real human beings as it is only possible in a Disney world (those sturdy limbs and pot bellies! Those bulging noses and slanted eyes!). Also it is one of those rare Disney fairy tales, along with Mulan and Alladin, in which the majority of human characters are non-Caucasian. It’s a bright, engaging bauble with half a dozen Elvis Presley songs for Mom and Dad, and just enough sass — at one point Stitch sticks his tongue into his nose and eats his snot — to keep the kids giggling. Lilo (voiced by Daveigh Chase) gives the usual lonely-but-superior Disney heroine a twist: she is a brat who has anger issues. Far from trying to save the whole imperial China or morph from mermaid to human, this Hawaiian handful has no goal loftier than the status quo — to keep living with her frazzled sister Nani. The action is set on the Hawai’ian island of Kaua’i, which the directors have since credited as the defining choice made in the entire development of the feature, for it not only directed the film’s very distinctive appearance but also introduced the concept of ‘ohana’, meaning extended family. When you hear that word for the first time it actually sounds nice – so far so good. Enter Stitch, a bad, blue killing machine from the planet Turo. Stitch, like Lilo, is parentless and lonely. He was created by a mad scientist — or, as he prefers to be known, an “evil genius”–who gave the creature only one instinct: “to destroy everything it touches.” Stitch escapes to Earth, a primitive planet that the Turans have allowed to exist as a “protected wildlife preserve to repopulate the mosquito.” Will Lilo, herself something of a little monster, be able to turn this space Satan into a nicely domesticated Hawaiian — a ukul-alien? You bet! It’s a fine example of Disney Darwinism: survival of the cutest. It is also a contemporary fairy tale without a baddie. It is a tentative revival of traditional animation, proving that, as long as you have a good, original story, you don’t need desperately digital fireworks to keep it moving. Imagine it or not but upon its release in the summer of 2002, Lilo & Stitch managed to do something that no other 2-D Disney film of the ’00s had or would do: it actually turned a profit during its theatrical release. Thanks to the buoyant style of the characters, it also boasted the most successful tie-in marketing of any film in that period; it inspired two direct-to-video sequels, a TV series and a Walt Disney World attraction. Overall Sanders and DeBlois’s vague animated retread of ET is surprisingly sparky, with snippets of laugh-out-loud dialogue and a rocking soundtrack, courtesy of Elvis Presley, Lilo’s favourite artist – most un-Disneyesque, wouldn’t you say? Filled with comic moments that are true gems, like Lilo’s temper tantrum over tuna and peanut butter at the beginning and Stitch’s Godzilla impersonation, Lilo & Stitch is one of the funniest movies of 2002, animated or otherwise, I’ve seen so far. Regrettably, towards the end the film veers off into a mess of weird aliens and Cartoon Network silliness and sometimes reeks of saccarine mawkishness. Oh well. Lilo & Stitch has been billed as a non-Disney, Disney cartoon. I couldn’t agree more. It’s a little faster paced, a little more slapstick, a little less sickly sweet, a little more real life. Just a little. Yet beneath it all, it still contains the stamp of Disney. Of course you get a pair of orphans – have you noticed how Disney loves killing off at least one parent of their characters? Lilo’s name is ridiculous – who would like to name a little girl, Hawaian or not, after an inflatable mattress? ‘Ohana means family’ was repeated far too often and soon lost its freshness. Is it worth watching? Yes, it is, just don’t expect too much. If you are additionally a fan of Elvis Presley, aliens and/or surfing you will be charmed for sure! This entry was posted in cartoon based comedy adventure, movie review and tagged Chris Sanders, Dean DeBlois, Disney cartoon movie, hawaii, lilo and stitch, movie review. Bookmark the permalink. Those are the holly proportions of Hawaiian native girls according to the gospel of St. Disney ;). I love that movie. It’s so cheesy, but I adore it. A couple of my guy friends were making fun of it the other night randomly. I think ‘Tangled’ and ‘Brave’ are the only ones that the hero/heroine have both of their parents. This movie is a bit cheesy but still far better than an ordinary Disney fare. It almost had a potential of ‘Shrek’. Almost. I agree on the “survival of the cutest”, but what really got me to love this movie is that even if the end is sgar-coated and all, you can see in Stitch’s grin that he didn’t turn completely new leaf: there’s still quite a lot of mischief there… It’s like a badass cuteness (well, as much as Disney can actually have one). But I better shut up, because I just love Stitch. PS Sleeping Beauty had both of her parents alive too. Wrongs in my life are numerous it seems 😉 and so can be said about typos. Lilo and Stich promote cute badasses but I would love to see you (or anybody) dealing with them in real life. Now it seems another typically anachronistic ‘wrong’ is raising its ugly head – my foolish desire to have fairy tales close to real life. Oh well. BTW correct me if I am mistaken but according to Grimm brothers the mother of Sleeping Beauty died prematurely. Did Disney change that? I love this film. Speaking of correcting wrongs, have you seen Ever After? It’s my favourite Cinderella adaptation. Yes now I do. It left me lukewarm although it had some good scenes. Stitch looks like my little Princess Sofie puppy. 🙂 I’ve never seen this one. Watch it during Easter holidays. It fits the mood.